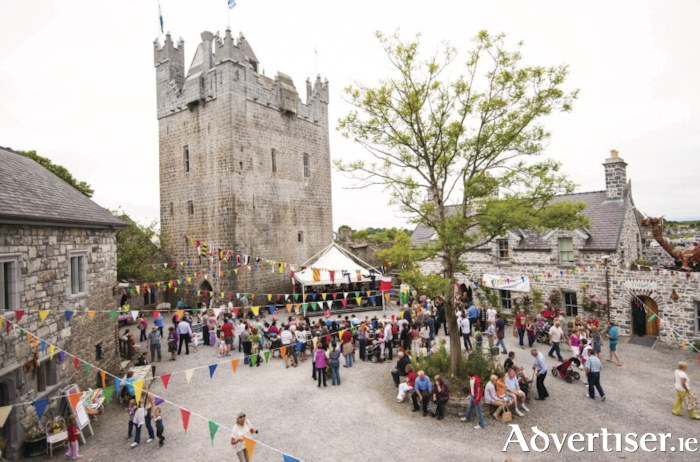 The charming surrounds of Claregalway Castle will once again provide the stunning backdrop to the ninth annual Galway Garden Festival, which takes place on Saturday and Sunday week July 7 and July 8. Once again thousands will flock through the gates to marvel at this wondrous occasion, which is so much more than just a wonderful gathering of the very best of rare and special plant traders from all over Ireland, but also the the location for a programme of expert talks, a venue for displaying fine artisan food and a crafts arena, including the best of ‘Made in Galway. On top of all of this, there will be a host of musical entertainment and open-air performance, with something for everyone. Stroll through the grounds and the buildings, inhale the wondrous smells, take in the atmospheric sounds that make up one of the west’s most charming events. On Saturday, internationally respected author, arborist and gardener Thomas Pakenham will talk on aspects of his most recent book - The Company of Trees, Kitty Scully will present ‘Greening up the Grey’ – the growing trend of gardens in the workplace in which she will share lots of practical organic gardening tips and update on her most recent gardening adventures with a technology company in Cork city. On Sunday July 8, internationally celebrated gardener, author, journalist and broadcaster, Helen Dillon will present ‘Starting Over’. Her famous Dublin garden has featured in magazines worldwide. She has recently begun a new grand project and will present her experience to date in her inimitable fashion. ‘Wild Plants of Lough Corrib’ is the theme of author, film-maker, herbalist and educator Dr Marina Levitina. The shores of Lough Corrib are home to an incredible variety of wildflowers, including many medicinal plants. Dr Levitina will talk about some of these, how to identify them, and what we can do to ensure they continue to thrive. Fanzini Circus Productions will delight with their brand new show – Ballet Poulet – when two world class Olympian idiots bring to you their latest masterpiece. Youth Ballet West will awe crowds with their very special dance performance. Yer Mans Puppets Cabaret will ntroduce some new characters and bring along old favorites to entertain all ages. Nemo the Magician will make a very special guest appearance on both days. The festival will feature real battles between knights in armour from Medieval Armed Combat Ireland. David Swift from historic re-enactment group ‘Claoimh’ will recreate aspects of local history in an highly entertaining way. A range of freshly cooked foods, handmade crafts and assorted wares are available as part of an artisan market. The Botanical Art Expo is a well-established attraction at the festival, and many of the paintings on exhibition are for sale, along with limited edition prints, and cards. It is also a wonderful opportunity to see Claregalway Castle. Eamonn O’Donoghue has funded and overseen the restoration of the castle for the past decade and a half, bringing in some of Europe’s top stonemasons and conservationists to ensure that the castle is returned to its original state. In the process, he had to overcome many obstacles in his mission to ensure that the castle was restored to the style in which it was constructed. When he acquired the castle in 2000, the building was in danger of collapse. The roof of the castle had been removed in 1653, following the famous Siege of Galway by Cromwellian forces. Mature trees sprang from the upper floors and the stone work was under threat. A major reconstruction programme was drawn up under conservation architect David Johnson, a former inspector of national monuments with The Office of Public Works. Eamonn never forgot the childhood picnic shared with his brothers and sisters and parents beside the bridge at Claregalway Castle. His father, Tom, a Toomevara man, a great hurler, and a civil engineer with Cork County Council, had a passion for Ireland’s romantic ruins. A photograph was taken of all seven O’Donoghues lined up grinning at the bridge. The family still have it at their Cork home. But Tom’s passion passed on to several of his children. Eamonn studied medicine in Cork, and archaeology under Michael J O’Kelly, the man who brilliantly interpreted the ancient tombs at Newgrange. Shortly after his appointment as ophthalmic surgeon to the Western Health Board (HSE ), Eamonn set out to find the castle. And the rest is history. The 2018 9th Galway Garden Festival takes place between 11am and 6pm on Saturday and Sunday, July 7 and 8 at Claregalway Castle. Entry is €10 and children go free – this entry fee gives access to everything on site – music/talks/entertainment etc with gate profits going to support CBM Ireland (Christian Blind Mission ). There is free parking close-by and a free bus courtesy of Bus Eireann runs regularly to and from Ceannt Station in Galway city. So come to Claregalway for a very special weekend. Page generated in 0.2428 seconds.